Lucky Choice items are highly rated, top-selling customer favorites with lower returns than similar products. Check out these suggested similar & related items below. 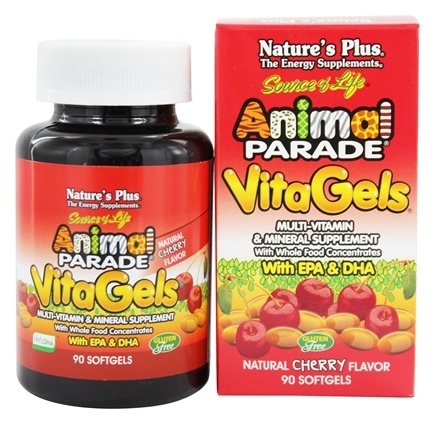 Natures Plus Animal Parade Vita-Gels’ broad profile of nutrients includes DHA and EPA, essential fatty acids that are critical components of healthy development through these years of tremendous growth. A broad range of 20 essential vitamins and minerals and 14 premier whole foods round out Natures Plus Animal Parade Vita-Gels’ precisely calibrated nutritional profile. Multiple vitamin-mineral (MVM) supplements, sometimes known as multivitamin-mineral supplements, contain a variable number of essential and/or non-essential nutrients. Their primary purpose is to provide a convenient way to take a variety of supplemental nutrients from a single product, in order to prevent vitamin or mineral deficiencies, as well as to achieve higher intakes of nutrients believed to be of benefit above typical dietary levels. Many MVMs contain at least 100% of the Daily Value (DV) or the U.S. Recommended Dietary Allowance (USRDA) of all vitamins that have been assigned these recommended values. Mineral levels may be lower, or in the case of high potency MVMs, most or all mineral levels may also be at 100% of DV or USRDA. Micronutrients that should be included in a complete MVM are vitamin A (or beta-carotene), vitamin B-complex (thiamine, riboflavin, niacin and/or niacinamide, vitamin B6, folic acid (folate), vitamin B12, pantothenic acid, and biotin), vitamin C, vitamin D, and vitamin E, and the minerals calcium, magnesium, zinc, iodine, selenium, copper, manganese, chromium, molybdenum, and possibly iron. Some MVMs also contain vitamin K, but people taking the medication warfarin (Coumadin) should consult their doctor before taking vitamin K supplements. Phosphorus is another essential dietary mineral, but is so abundant in the diet that it does not need to be included in an MVM formula. The only exception is for elderly people, whose diets tend to be lower in phosphorus. Calcium interferes with phosphorus absorption, so older people who are taking a calcium supplement might benefit from taking additional phosphorus. Potassium is an unusual case, as adequate amounts of potassium cannot, by law, be sold in nonprescription products. Thus potassium, when included in an MVM formula, represents only a trivial amount. MVMs may contain iron, but these should be taken only by people who have been diagnosed as having, or being at high risk of, iron deficiency, or who have a history of frequent iron deficiency. Some nutrients may be beneficial at levels above what is possible to obtain from diet alone, and an MVM formula can provide these levels as well. Nutrients that may be useful to most people in larger amounts include vitamin C, folic acid, and calcium. Vitamin E has long been thought to protect against heart disease beginning at 100 IU per day, but more recent research has cast doubt on the value of vitamin E for heart-disease prevention. Large amounts of vitamin B1, vitamin B2, vitamin B3, and pantothenic acid are often included in MVM formulas. Some people claim to experience improvements in mood, energy, and/or overall well-being when taking higher-than-RDA amounts of B vitamins. While there is not a great deal of scientific research to support those observations, one double-blind study of healthy volunteers found that an MVM supplement significantly reduced anxiety and perceived stress levels, and possibly improved energy and the ability to concentrate. The importance of including the nonessential nutrient beta-carotene in MVMs remains speculative. The synthetic beta-carotene found in most MVMs clearly does not prevent cancer and may increase the risk of lung cancer in smokers. Therefore, the inclusion of synthetic beta-carotene in MVM formulas is of questionable value, and it should be avoided by smokers. This concern was validated by the results of a large study in which male smokers who supplemented with synthetic beta-carotene had an 18% increase in incidence of lung cancer, compared with those given a placebo. On the other hand, because beta-carotene can be converted to vitamin A without causing vitamin A toxicity, some manufacturers use beta-carotene as a source of vitamin A. In contrast to synthetic beta-carotene, however, natural beta-carotene and several other carotenoids may be helpful in preventing certain diseases, including some cancers. Increasingly, natural beta-carotene and several other carotenoids are found in higher quality MVMs. Another class of non-essential nutrients is the flavonoids, which have antioxidant and other properties and have been reported by some, though not all, researchers to be linked with a reduced risk of heart disease. MVM supplements also frequently include other nutrients of uncertain benefit in the small amounts supplied, such as choline, inositol, and various amino acids. Preliminary and double-blind trials have shown that women who use an MVM containing folic acid, beginning three months before becoming pregnant and continuing through the first three months of pregnancy, have a significantly lower risk of having babies with neural tube defects (e.g., spina bifida) and other congenital defects. In one double-blind trial, schoolchildren received, for three months, a daily low-potency vitamin-mineral tablet containing 50% of the USRDA for most essential vitamins and the minerals. The subjects were “working class,” primarily Hispanic, children, aged 6 to 12 years. Dramatic gains in certain measures of IQ were observed in about 20% of the supplemented children. These gains may have been due to the correction of specific nutrient deficiencies (for example, iron) found in these children. However, it was not possible in this study to identify which nutrients caused the increases in IQ. Natures Plus Animal Parade is the world's greatest line of Children's Vitamins and Supplements! Only Animal Parade offers a cascading variety of luscious flavors, enticing textures and diverse formulations - making nutritional supplementation fun and easy for you and your kids. Featuring whole-food fruits and vegetables, along with other critical vitamins, minerals and nutrients, Animal Parade delivers superior-quality support for children's healthy growth and development. Animal Parade natural vitamins and multi-vitamins for children come in animal-shaped gummies, yummy liquids and drops in delicious flavors like bubble gum, cherry and grape - it's nutrition in disguise! Kids Love the Flavors. Parents Trust the Quality. A rainbow of deliciously tempting flavors that kids simply can't resist! Animal Parade premium multi-vitamins, vitamins and supplements for kids draw on the earth's natural sources to give children the highest level of nutritional support available on the market. Every Animal Parade product is enhanced with Source of Life's proprietary blends you won't find anywhere else. Natures Plus has been considered the gold standard in Natural Vitamins and Nutritional Supplements for over 40 years. In the early 1970s, when Gerald Kessler founded Natures Plus, he had a clear vision of the kind of products he wanted to produce. Carefully studying the natural vitamin market, he observed that consumers were seeking energy and an enhanced quality of life from their vitamins. He knew that only a supplement made with superior ingredients and the highest standards of manufacturing could result in exceptional products with the energy-releasing results consumers demanded. They continue to fine-tune their products and raise the bar for quality and performance in their industry. Today Natures Plus products are unsurpassed in their ability to release natural energy and provide the ultimate feeling of well-being. That's why they call them the "Energy Supplements." State-of-the-art manufacturing facility. Their facilities, which are FDA registered and NSF certified, maintain continuous adherence to cGMP compliance and superior standards through consistent review by their Quality teams. 100% Consumer Satisfaction Guarantee. Natures Plus is committed to supplying superior quality natural vitamins and nutritional supplements that meet the high-energy demands of their customers without shortcuts or compromise. 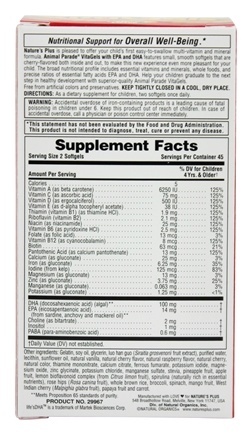 As a dietary supplement for children, two softgels once daily. Other Ingredients: Gelatin, soy oil, glycerin, luo han guo(Siraitia grosvenori fruit extract), purified water, lecithin, sunflower oil, natural vanilla, natural cherry flavor, natural cherry, natural color, beeswax, pineapple fruit, apple fruit, lemon bioflavonoid complex (from Citrus limon fruit), spirulina (naturally rich in essential nutrients), rose hips (Rosa canina fruit), whole brown rice, broccoli, spinach, mango fruit, West Indian cherry (Malpighia glabra fruit), papaya fruit and carrot. Energy and an enhanced quality of life are what the consumer is seeking in the natural vitamin market. Only a supplement made with the highest quality ingredients and the highest standards of manufacturing can offer consumers the energy-releasing results they demand. Natures Plus supplements are known as the energy supplements because the standards of excellence practiced by the Natures Plus' family result in products that are unsurpassed in their ability to release natural energy and provide the ultimate feeling of well-being. 100% 4 of 4 reviewers would recommend this product to a friend. After tasting a kazillion multi vitamins, this was the only one my son liked. The DHA & EPA are a rare perk in kid's vitamins. They can easily swallowed or chewed. My son likes the flavor & prefers to chew them. A great transition from chewable. It has a great ingredient list and is easy to swallow with no bad taste on your tongue. These are great for teaching kids how to swallow pills, and without a nasty taste in their mouth while learning. Nutritional profile is good. The products and the claims made about specific products on or through this site have not been evaluated by LuckyVitamin.com or the United States Food and Drug Administration and are not approved to diagnose, treat, cure or prevent disease. The information provided on this site is for informational purposes only and is not intended as a substitute for advice from your physician or other health care professional or any information contained on or in any product label or packaging. You should not use the information on this site for diagnosis or treatment of any health problem or for prescription of any medication or other treatment. You should consult with a health care professional before starting any diet, exercise or supplementation program, before taking any medication, or if you have or suspect you might have a health problem. Sorry, there are some issues below! Describe your experience with the product. If it met your expectations. What you liked/disliked. Do not include medical claims. The most useful comments contain specific examples about how you use the product, things that are great about it and things that you think are not so great about it. All product reviews are subject to un-biased moderation for objectionable content. This review is pending moderation and will display once it has been approved. Wellness Ambassadors standing by 7 days a week. Same day shipping on orders placed before 1pm EST. Free ship over $49. Pea Protein vs. Whey: Which Is Right for Me? Copyright © 2018 LuckyVitamin LLC. All Rights Reserved. This feature allows you to keep track of items you are interested in buying in the future. Once you purchase the items, they come off of your list and move to the quick reorder list. To add an item to your Wish List simply click the Add to Wish List link. You can add as many items to your list as you wish. You can Navigate to this list via My Account. To save items you frequently buy to a permanent list for easy lookup and re-ordering, try a Regimen. The above item is currently unavailable from the manufacturer and is therefore out of stock. Please fill in the form below to receive a one time automated email alert which will confirm when this item is back in stock at LuckyVitamin.com. Sorry, this item is temporarily unavailable. It's out of stock and we aren't accepting back orders at this time. Please fill in the form below to receive a one time automated email alert which will confirm when this item is back in stock at LuckyVitamin.com. We were unable to add to your order. Please try again or contact us for assistance. Fill your cart with your favorite wellness essentials and select Subscribe with Autoship. Select the frequency and quantity that works for you. You can change or cancel anytime. You'll get an email reminder before your order ships. Add more or skip as needed. Enjoy your time and savings! Find Your Products Fill your cart with your favorite wellness essentials and select Subscribe with Autoship. Set Your Delivery Schedule Select the frequency and quantity that works for you. You can change or cancel anytime. Get Regular Shipments You'll get an email reminder before your order ships. Add more or skip as needed. Enjoy your time and savings!